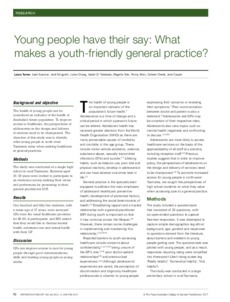 eCite - Young people have their say: What makes a youth-friendly general practice? Background and objective: The health of young people can be considered an indicator of the health of Australia's future population. To improve access to healthcare, the perspectives of adolescents on the design and delivery of services need to be championed. The objective of this study was to identify what young people in north-west Tasmania value when seeking healthcare at general practices. Methods: The study was conducted at a single high school in rural Tasmania. Students aged 16-18 years were invited to participate in an electronic survey seeking their views and preferences for presenting to their general practitioner (GP). Results: One hundred and fifty-five students, with a mean age of 17 years, were surveyed. GPs were the usual healthcare providers for 98.4% of participants, and 86% stated that they would like to discuss mental health, substance use and sexual health with their GP. Discussion: GPs can improve access to care for young people through good communications skills and treating young people as young adults.